For 2018, Ford will drop the 300hp V6 from the line-up, leaving the 310hp 2.3-liter EcoBoost 4 cylinder, the 460hp 5.0-liter V8 in the GT, and a flat-plane crank 5.2-liter V8 in the GT350, good enough for 526 ponies. Rear wheel drive is the only drive option, but 6-speed manual and auto boxes are available – with a 10-speed coming in 2018. An optional GT performance package gives the GT stiffer suspension, summer tires, Brembo brake upgrades, and unique chassis tuning. A 5-star NHTSA safety rating is aided by optional blind spot monitoring with rear cross traffic alert. Dearborn, Michigan – the home of the original pony car, the Ford Mustang. It’s the car the class was named after, and it’s now in its 6th generation with the new ‘Stang being launched in 2015, for the first time ever with a downsized turbo engine alternative. With the also new, much to the joy of track hooners, independent rear suspension, Ford is turning the Mustang into a bona fide sports car to challenge the traditional stigmas of pony/muscle car handling. 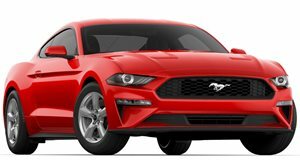 Two body styles exist, fastback coupe and convertible, with 3 engines lining up for 2018 to create a sporting experience for any level of Mustang admirer. Leather seats greet front occupants – they’ll likely be the only occupants due to the very cramped rear of the cabin with its sloping fastback roofline – and provide plenty support, though optional Recaro buckets can be equipped, though they can’t be heated or cooled and are only suitable for slimmer occupants. Pick the right seat for you and it’s easy to get comfortable with plenty seat adjustment and a telescopic height adjustable steering wheel. Look beyond the seats and the dual-cowl dashboard pays homage to its history. It looks and feels great in here, with high quality materials on most surfaces. The big letdown is the base 4.2-inch central display, which is inferior in all ways to the 8-inch touch screen you get with SYNC 3. 2018 models will also be available with an optional digital gauge cluster that adjusts per driving mode. Standard Mustangs boast a supple ride quality that’s fairly forgiving, though over damaged roads it can get a bit bouncy. If smooth roads, canyons, and race tracks are where you’ll be spending your driving time, a performance package nets you stiffer suspension that improve handling but compromises ride comfort. On GT models, the performance pack also adds summer performance tires, a limited slip rear differential, and recalibrated ABS, stability control, and electronic power assisted steering. The lightweight EcoBoost engine equipped models may lack aural pleasure, but the lightweight front end makes their turn-in crisp and sharp, while the V8’s handling can get a bit overwhelmed by the weight in the nose. If the sweetest handling thing this side of a supercar is what you want, the GT350 and 350R package immense handling ability due to a magnetic damping system and optional sticky race tires. For 2018, Ford is dropping the 300 horsepower, 280 lb-ft of torque V6 from its line-up. The entry point and only non-V8 is a 2.3-liter turbo EcoBoost motor with 310hp and 350 lb-ft. 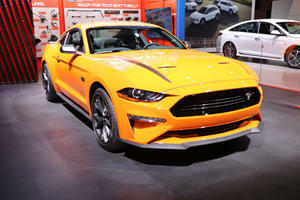 The GT model gets the 5.0-liter Coyote V8 with 460hp and 420 lb-ft. The GT350 boasts a flat-plane crank howler of a 5.2-liter V8, with 526hp and 429 lb-ft. Drive of course goes to the rear wheels, with a choice between two transmissions, a 6-speed manual and 6-speed automatic – a 10-speed auto will be available in 2018. The GT350 remains the ultimate driver’s car with only a manual box doing duty. Right from the base trim Fastback, Mustangs are generously equipped with an auto-dimming mirror, manual climate control, and Recaro cloth buckets. Premium models add heated and cooled leather front seats (except for the Recaro Sport Buckets), dual-zone climate, adaptive cruise control, and SYNC 3. The GT350 models get cloth/suede Sport seats, leather and Alcantara steering wheels, and dual exhaust with active valves for more noise. 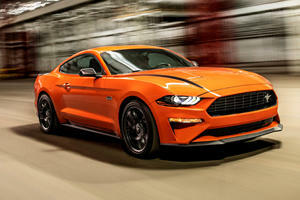 The Mustang scored 5 stars in NHTSA crash testing, and received Good ratings in most categories from the IIHS. Safety equipment available includes rear-view cameras, blind spot monitoring and adaptive cruise control. The Mustang in its 6th generation is better than ever. Now a credible handler and with plenty performance, the Camaro has a fight on its hands. Our pick is the GT, with the sweet Coyote 5.0 V8, and the optional GT Performance Package to sweeten the handling.